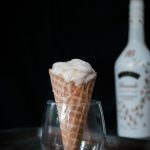 A delicious combination of Baileys Irish cream and salted caramel sauce in a vegan ice cream. In a small saucepan over medium heat combine the vegan butter, sugar, almond milk, and agave. Stir until everything is well combined and bring to a boil. Once it starts boiling stop stirring it. Let it continue to boil until it turns to an amber color. Remove from heat and add the vanilla and salt. Allow to cool for 15 minutes. Set the ice cream on the counter for a few minutes to let it soften slightly. In a large bowl combine the ice cream and Baileys using an electric mixer. Fold in the caramel. Don’t over mix, you want there to be swirls or caramel sauce. Pour the mixture into a loaf pan and freeze.